Be sure to watch our great videos that show 'how to' prepare our Oven Ready Elbows! 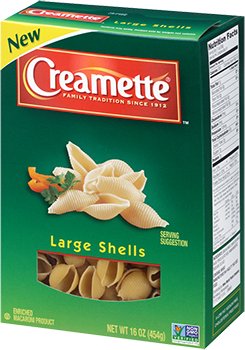 As rich in history as it is in taste, Creamette® makes the perfect pasta meal no matter who is coming for dinner! 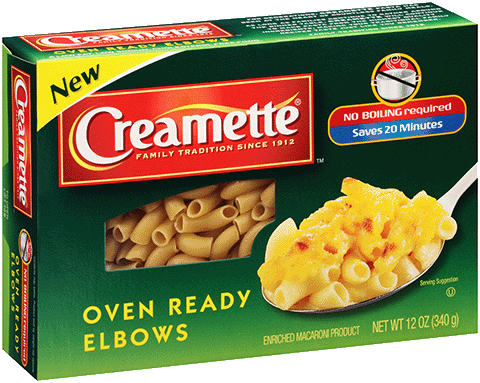 Creamette® is part of the Riviana Foods family of brands, a leading dry pasta manufacturer in the United States. Called "conchiglie" in Italian, there are many sizes of these seashell-shaped pastas. Everyone loves Large Shells in entrées, oven bakes, side dishes, soups and cold salads. Any favorite medium to thick pasta sauce works with Large Shells.